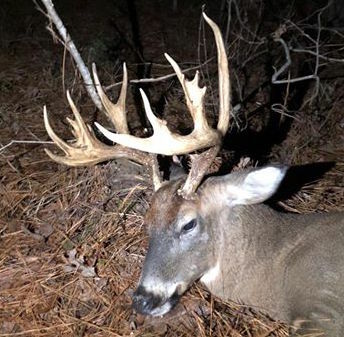 Trail cameras and a snowstorm helped Sam Holder kill this palmated Granville County, N.C. buck on Dec. 23, 2018. 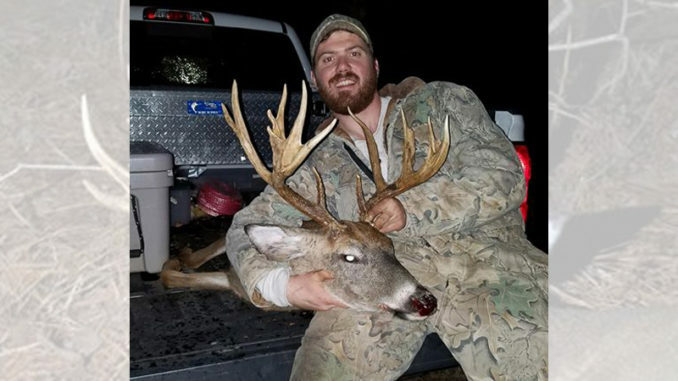 Sam Holder of Raleigh, N.C. got his first look at a buck with a big, palmated rack on his Granville County hunting property in early December. 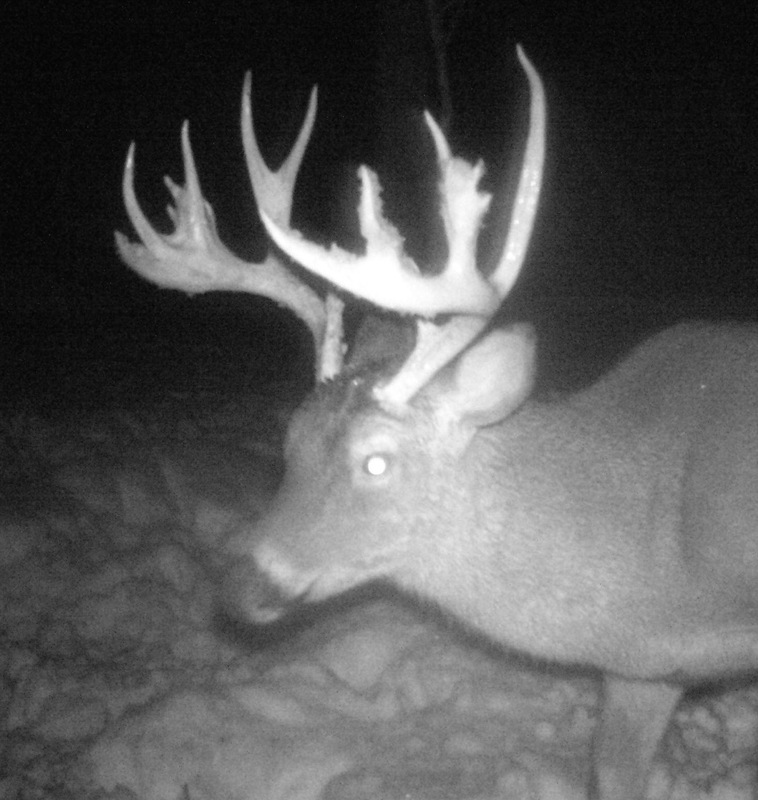 He killed the deer on Dec. 23, but he was beginning to think the season would run out on him before he got the chance. With lots of prayer and hard work though, things fell into place for Holder. “I named the deer Goliath. 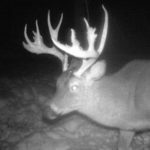 And he showed up on my trail cam every day, but always just a few minutes before or after legal shooting time. Either that, or he’d show up at 1 a.m.,” said Holder. The deer could walk into the camera’s range from any number of directions, so this made it difficult for Holder to find its bedding area. But that changed when a snowstorm came through the area in the second week of December. The deer constantly showed up in the dark, tormenting Holder. “I was able to follow what I was pretty sure were Goliath’s tracks. So then I knew what direction he was coming from, and where he was bedding. I put another camera there on Dec. 18. The next day, I got a photo of Goliath at 5:10 p.m.,” he said. Holder began hunting in the new spot right away. On his first hunt there, he saw a lot of deer, but not Goliath. “I probably saw more does that day than I’ve ever seen at one time. And on my second day there, it started off the same way. Does were everywhere, but they started acting nervous, and a lot of them got spooked and ran off. I was sure they hadn’t caught wind of me, so I got ready for Goliath. I knew that’s what had them spooked,” he said. Holder was right. Before long, Goliath came into the clearing with his head down, hot on the trail of a doe. But then the deer stopped, and not in a favorable spot for Holder. “He stood behind an oak tree for eight minutes. It was getting late in the evening. Finally, about 5:18, he stepped out and I had a clear broadside shot at him,” he said. 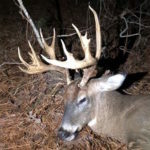 The palmated rack had 14 scoreable points. Holder pulled the trigger on his Kimber .308 and the Hornady bullet hit its target. “I was sure I hit him. He stood there for a minute, did the death wobble, then bolted for about 15 yards into a thicket. He died right there,” Holder said. The buck was about 3 1/2-years-old and its rack was palmated on both sides. 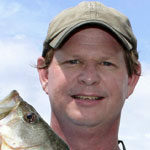 It had 14 scoreable points and has been green scored at 140 3/8 gross inches.